The North Korean leader, Kim Jong-un, and his wife, Ri Sol-ju, were among the hundreds of attendees who on Sunday saw in Pyongyang the performance of South Korean K-pop singers, who performed in the North for the first time in more of a decade amid the reduction of tensions between both countries. Kim has warmly welcomed the visit of the South Korean group - formed by eleven artists - to Pyongyang and has been enthusiastic about the celebration of the concert, which took place under the name 'Spring arrives' within the framework of a clear decrease of tension between the two Koreas, whose leaders are scheduled to meet on April 27. In addition to Kim and his wife, the leader's sister, Kim Yo-jong, and the country's honorary president, Kim Yong-nam, were at the concert, who in February headed the high-level North Korean delegation that attended the opening of the Olympic Games. Among the musicians was the well-known South Korean K-pop singer Cho Yong Pil, as well as the female band Red Velvet, according to the North Korean state news agency KCNA. "Our dear leader has expressed that his heart has swollen and he has been moved to see his people deepen their understanding of the popular culture of South Korea," the agency said. 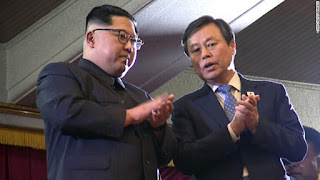 The South Korean Culture Minister, Do Jong Hwan, has assured that "Kim has shown great interest and has asked about the music and lyrics of the songs". The concerts in Pyongyang were scheduled after North Korea sent an orchestra known as the Samjiyon Band to the Winter Olympic Games held in the South Korean town of PyeongChang. South Korean officials have indicated that Kim has proposed that the two Koreas hold more cultural events, which could mean another concert in Seoul in the fall under the title 'Autumn arrives'.